Just heard one of the Yiddish dances (from the new CD) on R3. Look forward to gettng the CD. 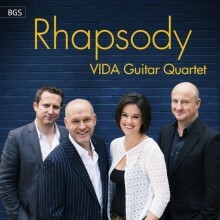 Hi Tony, You can now get Rhapsody on iTunes including the Yiddish Dances. I just attended your concert at BYU Idaho. Fantastic playing of course, but I really connected to your excellent musicianship and ensemble. I just tried to order a CD from iTunes but it only listed the price in pounds. Any solutions so I can pay dollars? p.s. thank you for coaching my student, and offering ideas on the music and how to prevent injury. Sorry for late reply. We will try and find out why it doesn’t list the currency in USD. Apologies in the meantime. © 2019 VIDA Guitar Quartet. All Rights Reserved.